Finances can improve, but it's easy to lose track of details unless you're alert. Money seems to go out faster than it comes in, but at least it's flowing! Remember that you can control the rate of flow. Concentrate on fine-tuning your physical health. Alter your diet to satisfy your current needs, adjust your schedule so you have time to rejuvenate, and get on track with your exercise routine. Wanting more from your lover than you're getting, you may feel perplexed about how to ask for your needs. The Leo Moon on the 3rd is the perfect time to bring the focus onto what you re feeling, but it won't work unless you're honest. You may discover that the way to a happy relationship involves giving as much as receiving. Be attentive to your partner's needs during the Moon on the 18th. Rash actions or temper can flare after the 16th. Careful scrutiny of your financial circumstances is important, and this is a good time to set up a budget and to keep better records. When Mercury retrogrades on the 17th, you may lose your focus. Be careful in expenditures from the 15th—19th, especially if you're buying property, since you may miss a critical detail. Investigate thoroughly, and wait to decide until later next month, if possible. If you must act on something after the 17th, your best day is the 21st. Getting organized can actually simplify your life and may resolve problems. 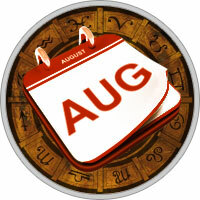 Use Mercury's retrograde from the 17th-31st to finish what you've already begun.